In addition to looking at specific industries, we are placing emphasis on our research of the processes which create the materials which support these industries. 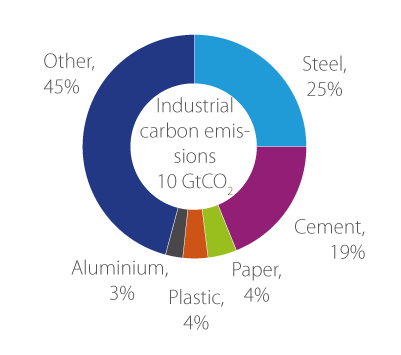 There are reasons why the five bulk materials dominate our industrial emissions, but the most important one is that we use so much of them. Of the four main sectors that account for our greenhouse emissions, the previous sections have shown how we can cut our emissions by 75% by using less transport, turning on the boiler less, and eating less red meat. 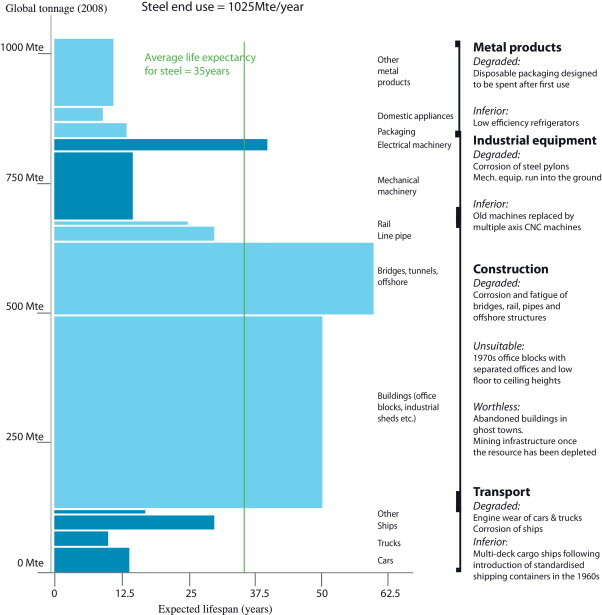 The remaining sector and the largest one, industry, seems daunting because it’s so complex. As we drive around our country, we see signs pointing to factories and warehouses of every type, but we rarely if ever enter them, and it’s very difficult to form a clear impression of how they all add up. However, fortunately, when we look at the data, industrial emissions are surprisingly easy to explain: most of them arise from making the bulk materials. Steel and cement account for nearly a half of all emissions, and if we add in plastics, paper and aluminium we reach 56% of the total. Overall, around two thirds of industrial emissions are associated with making materials (bags of cement, coils of steel strip, jumbo reels of paper), and the remaining third relates to the complex network of processes that are required to convert these basic materials into final products. "There are three reasons why these five bulk materials dominate our industrial emissions, but the most important one is that we use so much of them." There are three reasons why these five bulk materials dominate our industrial emissions, but the most important one is that we use so much of them. Without noticing it, our consumption of the energy intensive materials has grown to 600 kg of cement, 220 kg of steel, 50 kg of paper, 40 kg of plastic and 8 kg of aluminium per person per year – for every person alive on the planet. Obviously, this is not distributed uniformly, and in the rich countries of Western Europe, we’re using about three times this much. It’s almost impossible to realise that in the UK we use around 300kg of new steel per year each without noticing it but that’s the truth. The other two reasons why these materials are so important is that making them requires high temperatures (steel melts at 1650°C and we make cement at around 1500°C), and for some of the materials (particularly steel and cement, but also some important chemicals), the chemical reactions involved in extracting the useful material from its natural state, inevitably leads to the release of carbon dioxide. The five energy intensive industries – creating these five bulk materials – all pay heavily for energy. Figure 2 shows that energy accounts for around a third of the costs of making new steel or aluminium. "To understand this we need to look at how global demand for materials is likely to evolve and then ask to what extent recycling can replace the production of new material from ores, biomass and oil." And this same problem affects all five of the energy intensive materials industries: they need no environmental motivation to reduce energy use because of costs, and accordingly are all close to the limits of energy efficiency that they will ever achieve. If carbon capture and storage were available and publically accepted at large scale, industrial processes could connect to it, and if excess supplies of low carbon electricity were available, some materials industries could switch to electrically powered alternative processes. However, this is not the case today, and as discussed above for the generation of electricity, change is occurring too slowly for us to believe that it is an option we should include in our planning. It seems almost inevitable that the main mechanism to reduce industrial emissions is to make less new material, but before exploring this, we have one last option to pursue: to what extent can we supply future material needs by recycling existing materials? To understand this we need to look at how global demand for materials is likely to evolve and then ask to what extent recycling can replace the production of new material from ores, biomass and oil. Apart from cement (which we use in the highest volume), all the bulk materials are traded globally, so looking at how much any country makes tells us little about how much they demand. Typically, as countries begin their economic development, they build up their own bulk material industries, until they reach a stage of development that it’s cheaper to import the materials from elsewhere. 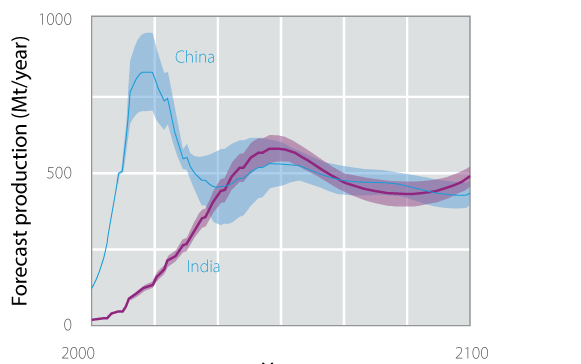 The UK’s production of steel peaked in the 1970’s and has more than halved since, China’s production expanded by a factor of 12 from 1990–2015 while at present India is rapidly expanding its steel industry. However, if we look at how much material countries demand, we see a different pattern. As countries get richer, they build up a stock of materials in use – and for example, as the graph shows, developed economies appear to stabilise their stock at around 12 tonnes of steel per person. Thereafter, demand is largely to replace the existing stock – and in the UK our demand of 300kg/person/year is mainly to replace existing cars, buildings and pipelines, rather than to create new ones. Based on this insight, we can predict with some confidence how global demand for materials is likely to grow in the future. For example, for steel, global output is currently around 1600 million tonnes of new steel per year, we can anticipate that – if nothing else changes – this will grow to around 2,500 million tonnes of new steel per year by 2050. This looks like very bad news for emissions, but is at least ameliorated for steel – and for the other recyclable materials (most materials except cement, other ceramics and composite materials) – by recycling. For most recyclable materials, recycling uses less energy than making new materials from ores, oil or biomass. Steel is a very important example of recycling: because it is magnetic, it is easy to separate from other wastes, and making new steel from old steel causes around a third of the emissions per tonne of making new steel from iron ore. Because steel is collected so well from waste streams, and because we have good data on the steel made in the past, we can anticipate the volumes of steel available for recycling in the future. "If we changed our ideas about fashion or worked towards goods whose controls and surfaces could be modified without replacing their structural core, we could live very well while keeping our products for twice as long and therefore replace them half as often." In rich countries like the UK, we’ve already built up a huge stock of buildings, cars, clothing, furniture and kitchenware so most of our materially intensive purchases are to replace existing goods rather than to add to the total stock. The rate at which we replace our goods is related to fashion and innovations in the ‘technology’ by which we often mean the control systems around the product. If we changed our ideas about fashion or worked towards goods whose controls and surfaces could be modified without replacing their structural core, we could live very well while keeping our products for twice as long and therefore replace them half as often. Most commercial buildings today are designed for 100-200 year lifespans, but on average are replaced after just 50 years. And for a thought experiment, consider what problems it would cause if all manufacturing of durable goods (physical objects lasting for more than a few weeks) stopped for a year. We’d hardly notice – because we simply don’t need to replace goods at the rate we choose to today. 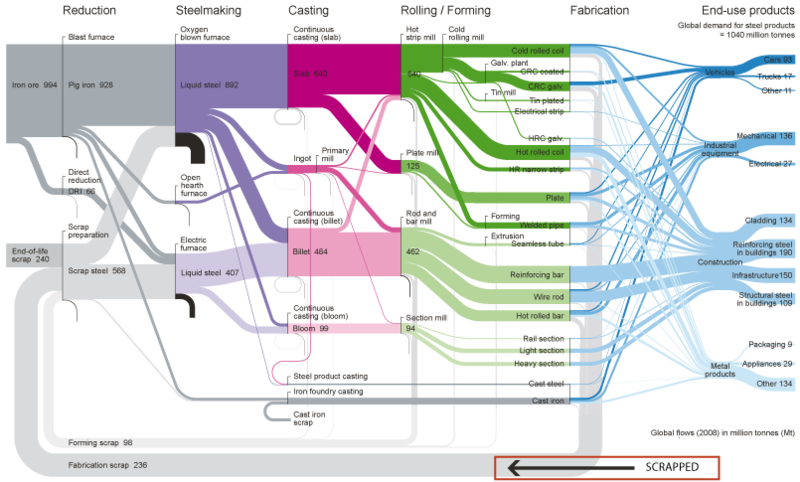 Figure 4 shows that all future growth in global demand for steel can be met by recycling steel that will be discarded – the purple area doesn’t increase from now to the future, because the blue area of steel being recycled, grows so much. An immediate consequence of this is that the world already has all the blast furnaces it will ever need for making new steel from iron ore. It’s not surprising that the European steel industry is facing a crisis at present, and that’s going to get worse as capacity increases elsewhere. India’s Minister of Steel, Mr Tomar, reaffirmed in July 2015 his commitment to increasing India’s steel producing capacity to 300 Mt by 2025, which will put even more pressure on European steel makers. Metals, plastics and paper can all be recycled. This generally saves energy and reduces emissions so it seems a clearly winning strategy, hence the great enthusiasm at the moment for the phrase “circular economy.” However, not all recycling processes are the same, and only very few lead to material with the same quality as the original material, so at the moment almost all recycling activities are ‘downcycling’ – taking materials that were used in high-grade applications and re-directing them towards lower-grades. The problem is two fold: the original materials production industries are energy intensive because the materials we want do not occur in the form we want them in nature, and we have to apply energy to separate what we want from what we don’t want. Over time, our produced materials degrade back towards their original state in nature (for example, steel rusts and wood rots) so recycling must supply enough energy to counter this. But in addition, the superb properties – the strength, ductility, stiffness, crack resistance and so on – of today’s engineered materials, depend on very finely controlled composition. There are thousands of different grades of steel, aluminium, paper and plastic on the market, each tailored to deliver the best performance for its original application. If these grades are all perfectly separated, then the recycling process leads to the same grade as the original material, and hence the same performance. However if the grades are mixed, or contaminated with other materials, the composition is not controlled, and the performance is degraded. As a result, high quality recycling is almost exclusively limited to internal processes within factories – where internal scrap is separated by composition, and fed back into the process that originally made it. Almost all end of life scrap – materials coming back at the end of life of a product – is ‘down-cycled’ because it comes back mixed in many different compositions. Therefore today, most end of life steel is recycled into reinforcing bars (which have low specifications on surface properties which are particularly difficult to control in recycled steel), most end of life plastic is combusted as a fuel, and most end of life aluminium from high grade ‘wrought’ applications is downgraded to less pure ‘casting’ applications, in particular engine blocks. Paper is potentially an exception to this rule, as the composition of recycled paper can be adjusted more easily, but unfortunately during recycling the long fibres that formed the original sheet are torn and shortened, leading to a lower quality product. All of the bulk materials industries have invested heavily in marketing programmes to advertise the ‘green’ credentials of their products. For cement, this marketing largely focuses on new, but as yet unproven, formulations. For the other materials, the marketing is mainly focused on recycling – but it must be read with great care. High quality recycling is only possible with highly segregated scrap streams, which are only found within manufacturing industries – and of course, it would be most energy efficient if we avoided creating any such scrap. End of life material is not well segregated, so can only be recycled to low quality material, with limited applications. This saves energy, but is not the perfect closed-loop advertised with the sharply designed logos of the circular economy enthusiasts. "We could meet our emissions target – a 75% reduction from today’s level of emissions – by buying products made with half the amount of material, and keeping them for twice as long." The bulk materials industries which dominate industrial emissions are already very energy efficient and where possible are already recycling all the material they can, but to low grade applications, so neither of these strategies will lead to a step change reduction in future emissions. However, the good news, is that we could actually live very well with much less material production. 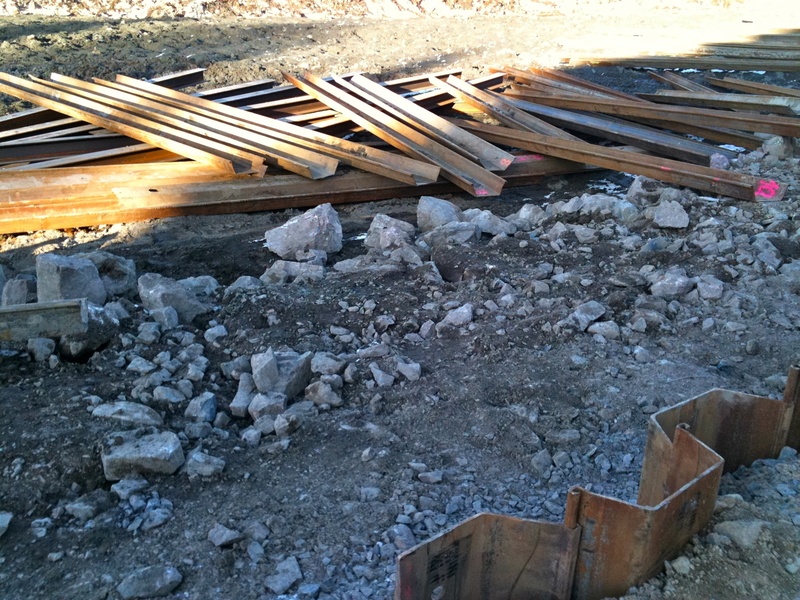 Partly because the bulk materials are made so efficiently, they are extremely cheap – in the UK it’s much cheaper to buy a tonne of structural steel than to pay for a day’s work by a structural engineer – and accordingly we’ve become extremely wasteful in the way we use them. We could meet our emissions target – a 75% reduction from today’s level of emissions – by buying products made with half the amount of material, and keeping them for twice as long. A significant fraction of all the material we make never makes it into a product, but is cut off or discarded during manufacturing, because the material industries made the wrong shape. For example, the diagram shows the global production of steel in 2008, demonstrating that a quarter of all steel made that year was scrapped before entering a product. More specifically, nearly a half of all sheet steel never enters a product, because it’s made in long coils, typically two kilometres by two metres wide, but no one wants a square sheet of steel. In cutting out car doors, lampstands and motor parts from these sheets, what we want doesn’t tessellate very well, so we create great truck loads of scrap. It’s recycled, but this takes energy, and it would be much better if we avoided making it in the first place. In addition to this scrap, we could design components better. If our sole driver is today’s costs, then because material is cheap and labour is expensive, the economies of scale lead us to make components with a constant cross section. However, in many applications – for example in I-beams that support the floors of multi-story buildings – the components should have a variable cross section. Optimising designs for the specific requirements rather than using standardised components e.g. variable cross section beams. But further to this, we could design products that were lighter, by delivering only the service that is required of them. We discussed small light cars above, and producing them would save material – in addition to the saving in energy in using them. But we’ve also found that commercial buildings are typically over-designed by 25-50%, because everyone involved in the design is motivated to avoid under-design, but no one cares about excess use. And in addition to these design and manufacturing options, we could live pretty well with a smaller national total of most products – because we use them so little. Stories of power tools bought in DIY super-stores being used for an average of one hour before being discarded are common, but we’ve seen the same thing with cars and buildings. In the UK we have around one car for every two people, and most cars have 5 seats. However, on average we use the cars for just 4 of the 168 hours in each week, with just 1.6 people on each journey. If we used the cars for 8 hours per week each, with 3 people on each journey, we’d need a quarter the number of cars, traffic congestion would be reduced by three quarters, and we’d all be £1000 per year better off! In rich countries like the UK, we’ve already built up a huge stock of buildings, cars, clothing, furniture and kitchenware so most of our materially intensive purchases are to replace existing goods rather than to add to the total stock. The rate at which we replace our goods is related to fashion and innovations in the ‘technology’ by which we often mean the control systems around the product. If we changed our ideas about fashion or worked towards goods whose controls and surfaces could be modified without replacing their structural core, we could live very well while keeping our products for twice as long and therefore replace them half as often. Most commercial buildings today are designed for 100-200 year lifespans, but on average are replaced after just 40 years. And for a thought experiment, consider what problems it would cause if all manufacturing of durable goods (physical objects lasting for more than a few weeks) stopped for a year. We’d hardly notice – because we simply don’t need to replace goods at the rate we choose to today.